The third University of Miami player to earn All-American honors (1952 at offensive guard), Nick Chickillo was one of the truly great 60-minute men in Hurricane football history. 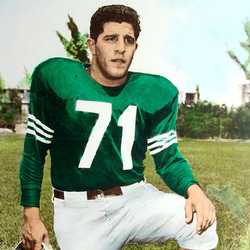 Chickillo was a stand-out player on both the offensive and defensive line while playing in the glory days of the early 1950's. A driving force behind UM squads which split Orange Bowl Classic games with Clemson in 1950 (a 15-14 Tiger win) and in 1951 (a 14-0 Miami victory), Chickillo was a three year strater for the Canes--helping guide coach Andy Gustafson's teams to a 21-11-1 record.